Rural communities in the northern boreal forest depend on a suite of wild species for subsistence, including large game animals, furbearers, fish, and plants. Fire is one of the primary ecological disturbances and determinants of landscape pattern in the northern boreal forest. We review responses of key boreal subsistence species to variation and change in post-fire stand age and other characteristics. Available data for 17 species indicate highly varied post-fire habitat requirements. Mosaics of differing stand ages generated by fire could therefore be most effective in supplying a suite of subsistence species to hunting-and-gathering communities. Recent and projected increases in frequency of large-fire years might produce a more homogeneous landscape dominated by younger stand ages. Increases in fire suppression around communities might also produce a more homogenous landscape, but dominated by older stand ages. Neither of these scenarios provides mixed habitats for a diverse suite of subsistence species. 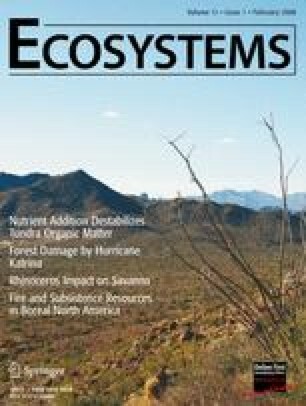 We suggest that one aspect of the complex suite of human–fire interactions is an understanding of wildlife and plant species’ response to fire in a subsistence region, in an effort to sustain ecosystem services critical to human well-being. Funding for the research was provided by the Alaska Human–Fire Interaction project (NSF grant OPP-0328282) and the Science, Technology, Engineering, Policy and Society (STEPS) Institute of the University of California, Santa Cruz. We extend our thanks to the following people and organizations for their insights, suggestions, and contributions: Sarah Trainor, David McGuire, Scott Rupp, Paul Duffy, Henry Huntingon, Orville Huntington, David Natcher, Monika Calef and Roz Naylor of the Human–Fire Interactions group; Yair Chaver; Kris Hulvey and Jae Pasari at UCSC; Jenny Bryant, Joee Huhndorff, Robert Lambrecht, Karin Lehmkuhl, Brad Scotton, Mike Spindler, and Lisa Saperstein of USFWS; Tom Paragi of Alaska Dept. of Fish and Game; and Louden Tribal Council, Galena, Alaska. In addition, we thank Dr. Eric Kasischke and an anonymous reviewer for their comments and suggestions, which greatly improved the manuscript.